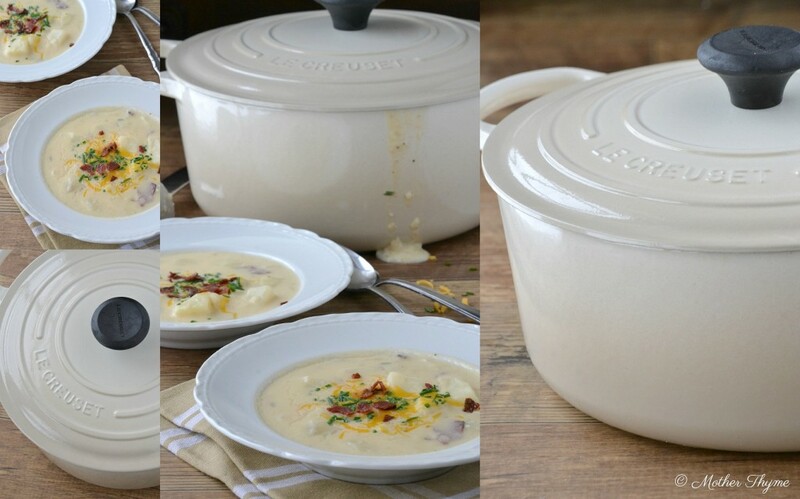 Baked Potato Soup + Le Creuset Giveaway! It’s cold here, really cold. Mother Nature can turn up the heat any time now. The high today is 12 degrees. Next week when the temperatures are back in the 30’s it is going to feel like a heat wave. On top of frigid temperatures it has been snowing non-stop. Cold and wintry days call for a warm bowl of soup. When you are stuck inside a pot of soup simmering on the stove is perfect for days like these. And if you are lucky to live in a warmer climate, I’m jealous. This soup can still be enjoyed while you snicker at us snowbirds that are stuck up north wishing for warmer days ahead. The best thing about this soup is it can be enjoyed without guilt. It is thick, creamy and only about 230 calories per serving. By swapping out regular bacon for turkey bacon and using just a little fat free half and half you slash the calories drastically. The soup is thickened with a little flour and water paste that is added into the broth. Add in some fresh chives, a little reduced fat cheddar cheese, and a scoop of fat free sour cream and you have a satisfying bowl of soup to enjoy. I love making a big pot of soup in the newest addition to my cookware, this amazing Le Creuset French Oven. Isn’t it lovely? The beautiful dune color is gorgeous in my cream kitchen. I love to find any excuse to cook with it. From hearty stews, chicken and rice, to soups, the Le Creuset French Oven is a workhorse bringing one pot dinners to your table cooked to perfection. I have been a huge fan of Le Creuset for years. The quality is superior made with premium cast iron that evenly distributes the heat. For over 85 years Le Creuset has crafted high quality cast iron cookware that last a lifetime, literally. From skillets, and braisers, grills and French ovens their cast iron collection feature pieces for all types of cooking. Le Creuset offers beautiful cookware, bakeware, and accessories to complete your collection. You can find all the latest products by visiting their website at www.lecreuset.com. If you are like me, you’ll be on their website forever creating a wish list of so many of their beautiful pieces. I have an exciting giveaway from Le Creuset! Le Creuset is giving away a 5 1/2 quart Round French Oven to one lucky Mother Thyme reader! Giveaway open to U.S. residents only. For your chance to win just fill out the entry below! A big thank you to Le Creuset for sponsoring this generous giveaway! Place potatoes in a large pot. Fill with water and bring to a boil over medium high heat and cook until potatoes are tender. Drain and set half of the potatoes aside. Coarsely mash the remaining half of potatoes and set aside. Preheat oven to 375 degree Fahrenheit. Place bacon strips on small foil lined baking sheet. Bake for 15 minutes until crispy. Crumble and set aside. Generously spray a large pot with cooking spray. Add 2 tablespoons chicken broth and onions and cook over medium heat for 4-5 minutes until slightly tender adding a little more chicken broth if needed. Add in garlic and cook for about 30 seconds more. Stir in remaining chicken broth, half and half, sour cream, mashed potatoes, cubed potatoes, crumbled bacon, cheese and chives. In a small bowl stir flour and water to make a paste. Stir into soup. Continue to cook over medium heat, stirring occasionally until soup thickens, about 15-20 minutes. 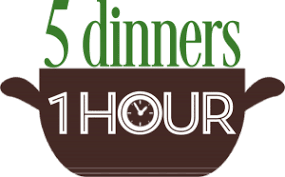 For a thinner consistency soup use only 2 tablespoons flour and 2 tablespoon water to make paste. Disclosure: I was provided a French oven for review. I was not monetarily compensated for this post. All opinions and reviews are my own. I would love to make THIS soup! It sounds/looks delicious! I would make soup! Maybe even try the one you posted today. It looks delicious! This looks so good! Just pinned it so I can add it to next week’s meal plan. I would love, love, love to win this! My hubby took me to the Le Creuset store in Smithfield, NC for my birthday and we purchased a shiny red wok! I made a chicken stir fry and a delicious Mongolian beef recipe! http://cookingwithelise.com/my-shiny-red-birthday-gift-and-a-mongolian-beef-recipe/ If I were to win this beautiful pot, I would make my Sausage Lentil Soup first! I would Love to make anything in that beautiful pot! Gorgeous!! 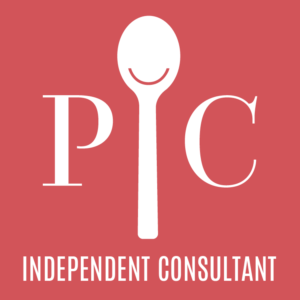 I shared this wonderful contest on the Cooking with Elise fb page! It got freezing here overnight! I left without a hat yesterday and my ears went numb. I’d definitely use the Le Creuset for something warm and comforting like stew. I would love to use this for ALL of my soups…my favorite winter meal ! French Onion soup. I’ve been wanting to make it but haven’t had a pot big enough. I love soup all year long so this pot would work well for me! with the frigid temperatures lately, all I can think about it soups stews! I would love to warm up with this pot!! 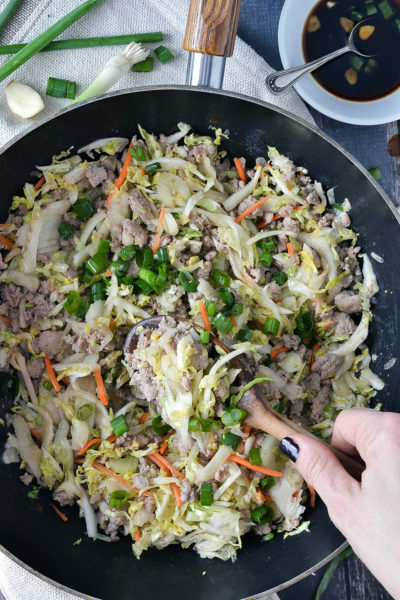 I would make this amazing soup – or a Chicken Dumpling soup!!! Thanks for posting this giveaway! This soup looks delicious!! The high here is 28 degrees today, so not quite as cold as you, but definitely cold enough for warm soup! Your pictures are gorgeous, too! Thanks for sharing! This would be so amazing… Thank you so much!!!!!! I like to make a loaf of bread in the French Oven. I’ve seen plenty of recipes on the internet that look great! I think a roast with potatoes and carrots sounds delicious. We have been having the same frigid weather here, so I would totally be making lots of soup with that awesome dish!!! And your potato soup looks amazing…love that is a healthy version!!! Homemade chicken noodle soup with lots of veggies for me including carrots and celery chunks! So great in the winter! Thank you! That soup sounds delicious! And love the dune color le creuset. A pasta dish that my husband’s grandmother used to make. I’d like to make a pot roast. Perfect comfort for the cold weather. It’s 13 degrees here in Ohio. Brrrr! I would love to make this soup and also Cream of Broccoli! Maybe so e slow roasted brisket! I’d make soup! And my absolute favorite – boeuf bourgignon!! I think beef stew would be winter-perfect to make in that gorgeous Le Creuset pot. That soup looks delicious! I love the idea of using turkey bacon! osso buco – of course! Yummy soup for a bleak winter day… thanks for the recipe and chance to win this wonderful kitchen item. i would make a chicken pot pie soup! just loves any kind of soup. I would just love to win this 5 and a half quart so I could make a great pot of turkey chili! Would love to read your chicken soup recipe. Oh yum!!! I’m so going to make this soon!! This would be wonderful to cook my famous chili in!! My yummy beef and barley soup! I would love to cook a pot roast in my new french oven!! It’s cold where I live too, so I would love to make some of your Baked Potato Soup! Soup, hoisin pot roast, all kinds of things. Thanks for offering the giveaway. I got a Le Creuset French oven for Christmas. I can’t say enough good about it … I just wish I had gotten the larger size. I’m off to try your potato soup recipe in a slightly smaller version. I would cook my kids favorite Chili in the Le Creuset. It would also be a great addition to the bakeware pieces I already have! I think I would make a french onion soup. I would love to make a pot roast!! Wow, looks amazing. I have to put that on my list to make. Yum! I’m making minestrone tonight, but this will go on the menu for next week (only with full fat ingredients…your brain and body need fat!!). Would love to win the Le Creuset! Good! I’ve been trying to re-make a baked potato soup for years. I LOVE potato soup. I’m sure that’s not a surprise. Okay I’d totally make soup or a huge batch of mac n cheese ha. Or maybe seasoned popcorn? This soup looks amazing…I may have to make this soon…cold here as well and I love making soup. Fat free half and half is one of my favorite skinny tricks too! This soup looks awesome. It’s freezing in Wisconsin too! It’s soup weather……so this soup or any of your other recipes for soup. This looks delicious! That soup looks amazing and the pot is so beautiful. I would love to make this soup and to try out some other recipes! 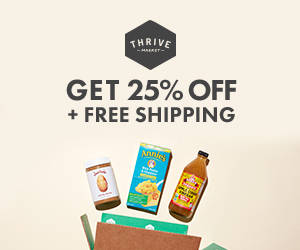 Such a great giveaway, I’d love to make soup! Beautiful French Oven that would make a really lovely beef stew. I would love to make chicken and dumplings in that Le Creuset French Oven! I would make corn chowder! I would love to cook a broccoli and cheese soup in it! I haven’t had it before and it sounds so delicious on these “warm” 40 degree weather days! I would make stew with dumplings because it is 11 degrees out and snowing like crazy! Pot roast! I’ve been craving it and you can start browning on the stove top. One less pan! I’d love to make this soup! Baked potato soup is my weakness! 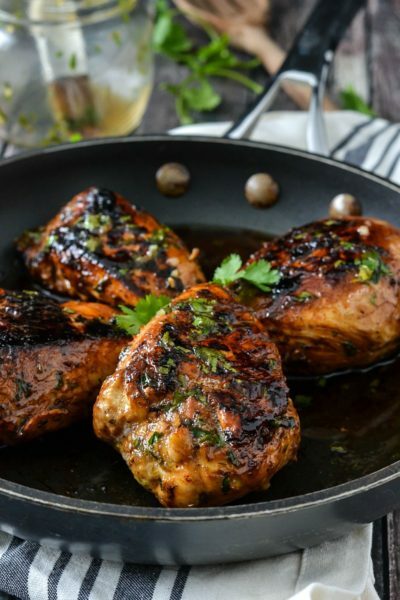 I would love to make the Chicken Marbella recipe I’ve seen on blogs lately. 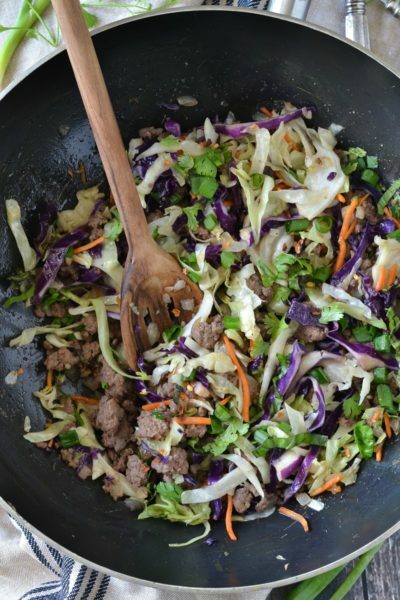 I would make some sort of one pot meal (TBD) because I love the versatility of this piece. Thanks for the opportunity! Most likely a pot roast! I would cook my mom’s squash soup! Any soup. It was VERY cold for me last week and in the 80’s this week. I would still make soup. I would make a chicken pot pie soup and broccoli cheese soup too! Yum! Soups, stews, short ribs, i could go on and on with what i would love to cook in this pot. A nice warm soup for these cold Midwest nights. I think so Coq au Vin would go nicely in this beautiful casserole!!! I would love to make beef stew in that gorgeous pot! A low and slow beef stew. I would love to make a minestrone in that beautiful pot! I would make a hearty stew! That French oven is perfect for soups, but I think I might also try baking some bread in it to go along with the soup! Thank you for the opportunity!!! 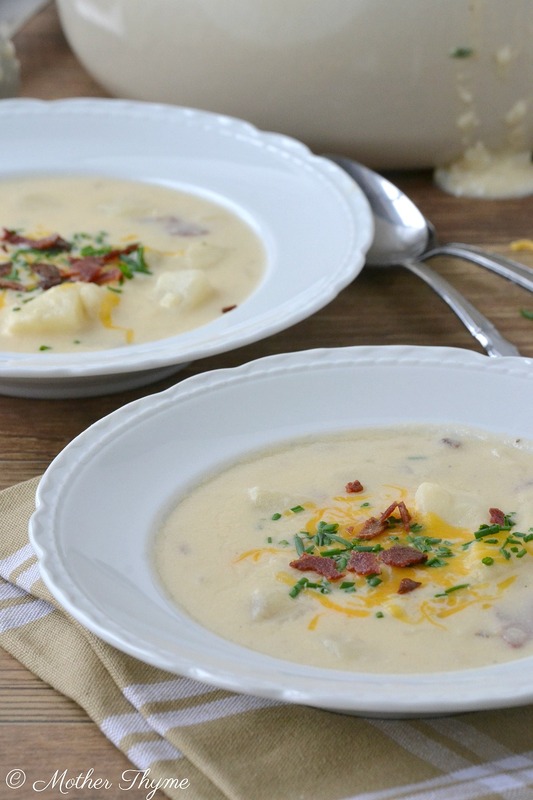 That is one really nice looking baked potato soup! My mom’s receipe for Beef Stew with dumplings. I would make soup and stove to oven dishes. Would love to win! Butternut Squash and Beef Tagine! What a gorgeous color! I’d probably make winter lamb stew for dinner in this pot! Wow… I would so love to be able to cook in that beautiful pot! It would be neat to make the Baked Potato Soup. Have made Leek Potato Soup for years but like this new twist. I would also use the pot for other soups, roasting chickens, making beef tips, meatloaf, baking bread, and so on and so on! It is such a versatile pot I can see using it virtually every day for something. I would love to cook an authentic earthy bolognese. Would love your recipe.Bolognese is divine! 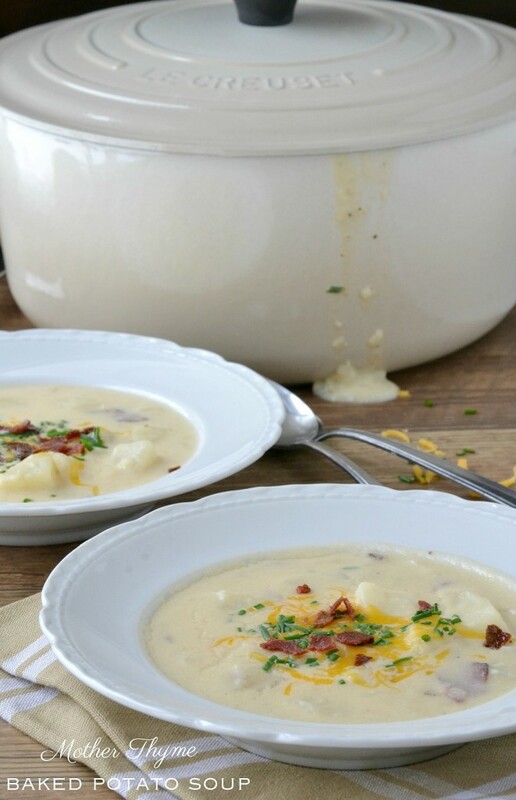 I was thinking of making loaded potato soup this weekend! Love your version. What a beautiful pot. Perfect for braised chicken. 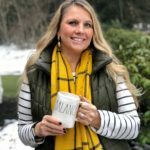 Love this soup, Jennifer! 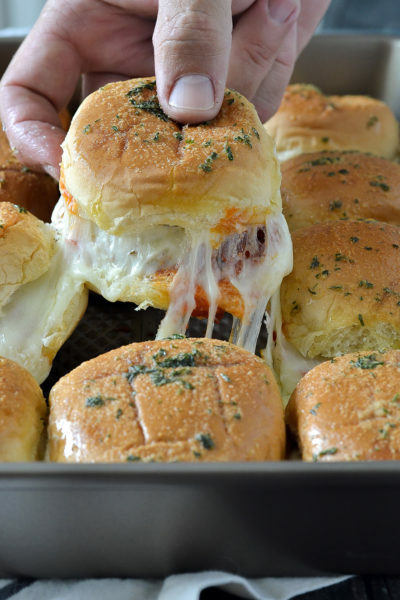 It looks so delicious and comforting. Thanks for the great giveaway, too! Beautiful soup! My Daughter’s birthday was yesterday (the 23rd) and I always said she was born on the coldest day of the year. I happen to live in a warmer climate, so don’t be jealous, it’s not so warm here either with those arctic blasts coming down on occasion! Wonderful Give-Away! I have always dreamed of owning my own Le Creuset! Love it!! 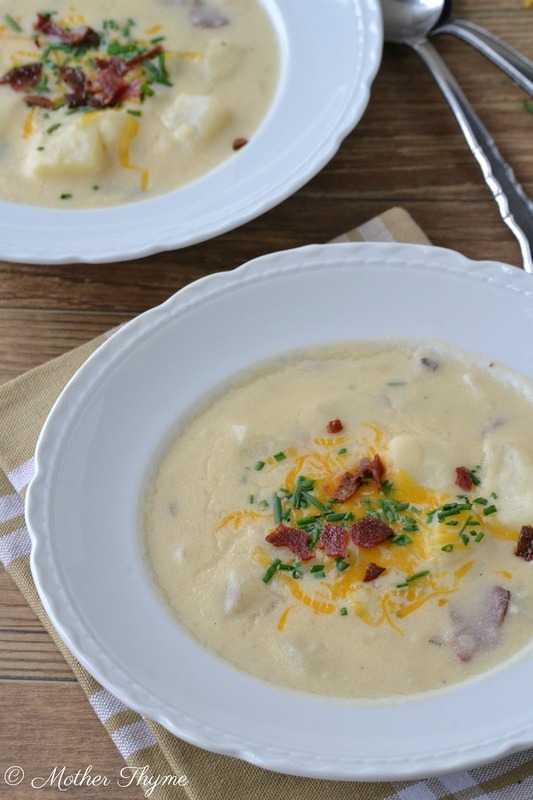 My hubby loves baked potato soup so I will have to make this for him sometime!!! I might have to try this tomorrow! I would love to make gumbo in it! I’d cook a Italian soup that my family loves! 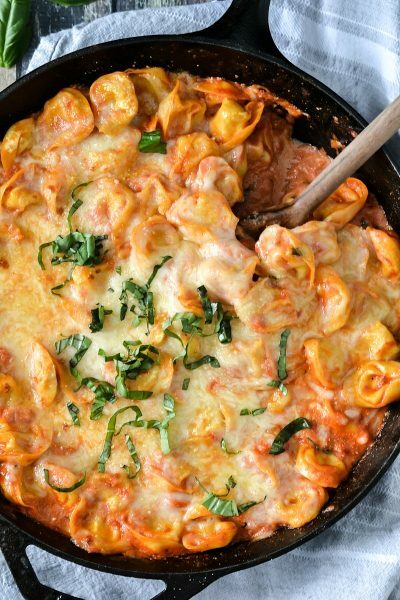 Oh my goodness – this looks so comforting and hearty! Baked potato soup has been on my “to-make” list for so long and I think I’ve found the perfect recipe. Thanks for the awesome giveaway too! I would totally make this soup in this gorgeous french oven! I am a sucker for any kind of soup! Curried lentil would probably be my first! Loaded potato soup all the way. I just discovered a recipe from Cooking Light about two weeks ago, and I’ve made it like 3 times already. I wanna customize my own version of the soup. I would do a pot roast with root vegetables & onions. Absolutely everything. Pot roast with carrots and potatoes. I would love to cook roast chicken and potatoes! A garlic-y brisket would be delish cooked in that! VEGGIES! Any kind, any way…Roasted, Braised, Wilted, Creamed, Mashed, Soupified! I would love to make ANYTHING in this beautiful pan! Roasted chicken, chili, cheeseburger soup. So excited to see this giveaway. I have dreamed of owning one of these for years! I would love to make a big pot of taco soup in the beautiul pot. Honestly, I’d love to make anything! I’ve wanted to own one of those pots for the longest time! I can’t wait to try this soup in (hoping) my new Le Creuset dutch oven! I bet chicken and dumplings would be amazing in that pot. It looks perfect for mujaderra! I would love to christen the le creuset by cooking braised duck legs in it! Love the pot and the color. First thing I would make would be this potato soup. My all time favorite! love any kind of soup, I left out the bacon and baked the skins on the potatoes instead to give it some crunch. I made chili last night because it’s *freezing* here! And I would love to try one of my favorite chicken recipes in that pot. I am going to try this recipe. It looks so good like you could eat it right off the screen! Oh would drove to win this and am going to try this recipe tonight, thats actually how I found this post! This soup looks stunning and of course the Le Creuset giveaway doesn’t look all that bad either! I think I would definitely make a big hearty pot of soup if I won! Swoon. First up would have to be Chicken Noodle Soup for the inevitable sick day that I’m sure is coming my way! A big pot of pinto beans to use those and that wonderful bean ‘liquor’ over polenta or with a hunk of hot cornbread! I looooove anything braised in Le Creuset! I will be making this soup soon, would love to have a Le Creuset pot to cook in, i have been told that they are wonderful for cooking, Thanks for a chance to win one. I’d love to make mac & cheese and bake loaves of crusty bread from recipes I’ve found. Potato Soup for dinner tonight….I really need this for my soups..using a copper bottom pan for mine now…just doesn’t seem right. The pot and the soup look beautiful! Yum, I just love this soup! Would LOVE to win this beautiful pot! I’d bake a loaf of no-knead bread! That soup!!! That soup looks so delicious and I just wanna dive right in. It is definitely soup weather here too. Would love one of these!